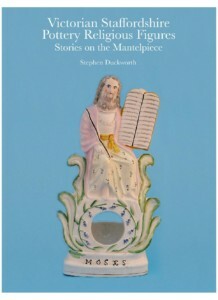 ‘Victorian Staffordshire Pottery Religious Figures – Stories on the Mantelpiece’. The book is based on his own collection but with a comprehensive catalogue which illustrates in colour over 220 religious figures. There are Old and New Testament figures but also a wide range of other religious subjects from anti-popery campaigns to holy water stoups intended for Roman Catholics, and from temperance figures to unusual saints. Three chapters of social history cover the Victorian religious context, an assessment of who were the main purchasers of the figures, and the Victorian home and how it was furnished and decorated. The book Is available on Amazon, or from accpublishinggroup.com (register on their website for a 20% discount).